This Article examines the history of Title VII disparate impact law in light of the policy and potential constitutional questions the Court's recent decision in Ricci v. DeStefano raises. My analysis shows that, contrary to popular assumptions, disparate impact doctrine was not a last-minute, ill- conceived invention of the EEOC following Title VII's passage. Instead, it arose out of a moderate, experimentalist regulatory tradition that sought to use laws to motivate employers to reform employment practices that posed structural bars to employment opportunities for racial minorities, regardless of invidious intent. Non-lawyer activists within the National Urban League first pioneered these experimentalist regulatory strategies at the state level. They then passed them on to the EEOC for use in the early years of its existence, backed by the potential litigation threat posed by the NAACP. 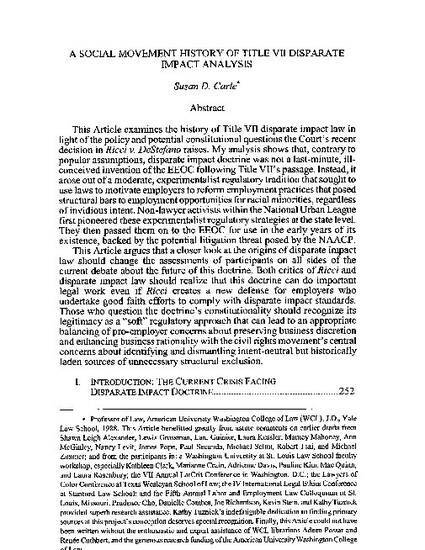 This Article argues that a closer look at the origins of disparate impact law should change the assessments of participants on all sides of the current debate about the future of this doctrine. Both critics of Ricci and disparate impact law should realize that this doctrine can do important legal work even if Ricci creates a new defense for employers who undertake good faith efforts to comply with disparate impact standards. Those who question the doctrine's constitutionality should recognize its legitimacy as a "soft" regulatory approach that can lead to an appropriate balancing of pro-employer concerns about preserving business discretion and enhancing business rationality with the civil rights movement's central concerns about identifying and dismantling intent-neutral but historically laden sources of unnecessary structural exclusion.